Four Queensland scholars were sponsored by the QLD Crawford Fund Committee to attend the 2017 Crawford Fund conference this year in Canberra. In addition, we are pleased to have had three scholars sponsored by Central Queensland University (CQU), two scholars sponsored by both the Australian Animal Health Laboratory (AAHL) CSIRO and the University Of The Sunshine Coast, and one scholar sponsored by the Australian Agricultural And Resource Economics Society (AARES) QLD. Scholarships are offered to young Australians with a genuine interest in international agricultural development to attend the conference. I was lucky enough to attend the Crawford Fund Conference for 2017, titled “Transforming lives and livelihoods: the digital revolution in agriculture.” As a fifth year agricultural science student with an interest in international food security, I was very excited to attend. While I understood that data and technology was an important factor in agricultural systems, I was interested in finding out more about the impacts that this can have, on both a global and local scale. I was particularly interested in the way that less developed areas are influenced compared to more developed areas, and the way that different communities interact with, and are influenced by, technology. Being exposed to so many speakers from all over the world from many different fields was an amazing experience, and I was able to learn about transforming lives and livelihoods from a range of different perspectives that I had never been exposed to before. The scholars program ran over three days, with the first day dedicated to scholars meeting their mentors and talks from speakers involved in the agricultural sector. Our mentors were able to give us direction, and put us in contact with people attending the conference who might be interested in the same fields as us, and who we might like to make contact with. Being assigned to a mentor is a great initiative for scholars, as it proves a point of contact and direction in what could be a potentially overwhelming experience. Dr Lindiwe Majele Sibanda was the keynote speaker for this event, and her address was the highlight of the conference for me. In the context of many incredible speakers, her passion and personal experience made her talk stand out, and it was obvious that the entire room was inspired by what she was saying. Both her keynote address and panel discussion gave a unique perspective to the conference theme. The biggest take away from the conference for me personally was that nutrition is a very important factor in achieving food security and a healthy population, and that this needs to be a key consideration when it comes to writing and implementing policy. Honestly, this is an issue that I had never given a great deal of thought to prior to attending this conference. Although I understand the importance of eating a balanced and nutritious diet, from a food security perspective, I have always considered calorific intake to be the most important factor. The biggest challenge for me was trying to retain all the information from the many speakers at the conference. Every single talk over the conference was packed with information, and at times it was overwhelming trying to take everything in, and processing this information before the next talk had started. Overall, the Crawford Fund Conference has been a highlight of my five years at university. It was amazing to hear the perspectives of so many people who are working in this field, and being exposed to so many people who are passionate about what they do. I am very excited at the prospect of potentially returning next year, and I would highly recommend this experience to anyone interested in this field. I must congratulate the organising committee for a wonderful and a very well organised conference. I had a pleasant time with easy access to the venue and accommodation. The presentations by speakers both at the Eastlakes Football Club and at the Parliament were the highlight of the conference. The opening address by Dr Lindiwe Sibanda and Professor Andrew Campbell were very enlightening. As someone who has just completed a PhD in the broad field of agriculture, I find the journey these both took in their early career though contrasted but with similar ambition and outcome. Their talk gave me a broader perspective to break into new grounds in international research in agriculture. I must add that experience of researchers doing work, as volunteers in developing countries were very enriching for me. The opportunity in the private sector was specifically great particularly as we were lead into a wide range of opportunities available in that sector. The dinner arrangements which allowed for meeting up with others and discussing areas of interests and opportunities were excellent. It brought in many others who have wide experience as both academics and practitioners in the broad field of agriculture, and provided a very in-depth pool of people with vast knowledge and experience I could network with. I had the opportunity to meet many of those I wanted to talk with and share my interests. The topics covered on the second day at the Parliament were just exceptional. The choice of speakers was great. From policies to technologies, research work and practicing in Australia and overseas, particularly in the developing countries was great. As someone from a developing country (Solomon Islands), I find such work very relevant and something I can be part of. Although, these studies and work were conducted in other countries, I find them as opportunities I can also do in my home country, as there are a lot of similarities in all the aspects of the communities as well as the challenges. I am sure with the support from groups such as ACIAR, opportunities are available for such work to be conducted in other countries such as Solomon Islands. The mentoring arrangement was also another highlight of the conference. I am grateful to the organising committee for such arrangement because it really supported me in exploring opportunities in making new grounds in agriculture research and job opportunities. I really owe my mentor Dr Rohan much gratitude for his time and putting me up with some of those who share my area of interests. It was truly a rewarding experience. I was inspired by Dr Lindiwe Sibanda’s Sir John Crawford Memorial Address titled ‘A New Narrative for Ending Hunger’ wherein she challenged the audience to use agriculture as a key tool to improving population health. Specifically, Dr Sibanda called for agricultural research projects to incorporate a stronger focus on improving nutrition security. She drew on her extensive experience as an animal science researcher in Africa to share personal case studies of how certain agricultural projects focusing on increasing calorie consumption (e.g. grain based farming) can contribute to the dual-burden of chronic disease in developing countries. For example, in some communities it has been observed that levels of childhood stunting and adulthood obesity occur in the same household demonstrating that families might be consuming adequate carbohydrates but are missing out on crucial micronutrients sourced from fruits and vegetables required for adequate physical and cognitive growth. This affirmed to me how crucial it is for research for development projects to involve multiple disciplines to ensure a holistic approach. I found that this support for better collaboration between the public health and agriculture industries was echoed in other keynote presentations and shared by many conference attendees – including experienced researchers in CSIRO and ACIAR. The key theme of this year’s conference revolved around the role of digital tools in agriculture. I was encouraged to learn how mobile-acquired-data apps like CommCare can be used to not only improve the efficiency of collecting data on the field for the researchers but how digital apps can be used to give back to the farmers in real-time. For example, Stuart Higgins Director of Agricultural Impact International shared a case study from Vanuatu where researchers worked with cattle farmers to assess the impact of using the CommCare app. The project team found that inputting the weight of cattle directly into the app reduced data input times and made it easier to collate and analyse the results. It also meant that the researchers could print a report outlining the weight of the cattle and give this back to the farmer at the end of each day. This enabled the team to empower the farmer with knowledge in real-time which can enhance uptake and retention of participants. It was exciting to see how digital apps enable the two-way exchange of knowledge for the benefit of all stakeholders both researchers and smallholders. In conclusion, I would like to thank the Crawford Fund for providing the comprehensive Scholars program to enable early career researchers such as myself to attend the annual Crawford Fund Conference – this year entitled, “Transforming Lives and Livelihoods: the Digital Revolution in Agriculture.” As a Public Health Nutrition student who is just about to commence my Honours year of research exploring the food security of Pacific Islander farmers involved in ACIAR research-for-development projects, participating in this conference occurred at an opportune moment in my career. It gave me an invaluable opportunity to learn from experts in the field of international agriculture research and to network with like-minded peers. Through compelling personal stories shared by the keynote speaker, Dr Lindiwe Majele Sibanda, as well as research presentations on the main conference day and motivational advisory sessions during the Scholars’ days, I was challenged by the significance of ensuring that nutrition is the next food security priority. It is easy to focus on maximising yields to assure no one goes hungry. However, hidden hunger is a real and present threat, where people consume enough food (often processed, refined and poor quality) to be threatened by obesity and non-communicable diseases, but through a lack of dietary diversity and limited access to nutritious foods also suffer from malnutrition, stunted growth and developmental issues. I am not an agricultural scientist or nutritionist but rather a marine biologist; however, through this conference and my attendance at a World Fish symposium in Penang this year (my attendance at which was partially funded by The Crawford Fund), I have decided to focus on nutritional security in my future studies and career. The conference obviously focused on terrestrial agriculture rather than fisheries, however attending was still a valuable experience from me. For its own sake, learning about current developments in agriculture was interesting and worthwhile. My honours research is looking at the role of fisheries in Pacific Island food security, so it was valuable to learn about the agricultural side of food security in the developing world to broaden the scope of my understanding. More broadly, there were a number of lessons that could be applied in my field. The use of mobile phone technology in communicating with rural farmers has potential applications in fisheries, for example in collecting catch data or sending out weather alerts etc. More broadly, the importance of having large and accurate global data sets and the associated challenges of collecting that data in the developing world is equally applicable in the fisheries sector. I think the most valuable part of the conference was the scholar days. It was an excellent opportunity to get advice from people in a range of positions with different experiences. We heard everything from broad motivational career advice to specific recommendations on how to network and apply for jobs. For me, the most interesting sessions were from young and early-career researchers doing research for development overseas. It was both interesting and useful to hear advice on how to maximise your effectiveness overseas, both personally and professionally and tips for working within a different culture. Overall, I think that the conference serves an important role in connecting and promoting dialogue between different demographic groups within the agricultural research for development sphere, be it across the private/public/academic divide, between scientists and policy makers or between generations. I would certainly recommend the Crawford Fund Conference to any student wanting to make connections and hear a broad range of perspectives on cutting edge agricultural research. The Crawford conference provided a unique platform to network with both early and late career research and professionals working on a broad range of agricultural issues facing both Australia and the international community. I was able to connect with a number of individuals working both within my own research space, as well as individuals working on issues I knew very little about, which provided me with broader understanding of how researchers are addressing the multiple issues facing agriculture. I was incredibly fortunate enough to have a mentor with an incredible understanding of the parliamentary process, and from our discussions I was able to understand the recent Australian political landscape from a truly unique perspective. Furthermore, my informal discussion with John Anderson also provided invaluable insights into the political decision making process and the current state of politics in Australia. The informal discussions I had with a number of extremely accomplished individuals were a highlight of my time in Canberra. The Crawford fund has done an amazing job making the connections between late and early career professionals occur in such a seamless manner. The data revolution may still be a long way from having a major impact in smallholders, but the presentations throughout the second day at Parliament House provided an invaluable insight into where data is taking conventional agriculture in developed countries. Personally, I gained a lot from the presentation and responses to audience questions from Dr Mario Herrero; I gained an invaluable understanding of genetic diversity from Dr Ken Street; and Professor Salah Sukkarieh’s presentation on robotics was equally enlightening. The RAID network event and scholar day provided something which if I was a younger scholar, would have been invaluable. Many of the RAID-ers provided first hand practical advice on getting work overseas and the realities of that experience. After speaking to other scholars they found the RAID events were helpful in understanding the ways of translating research interests from the local stage to the solving global issues. 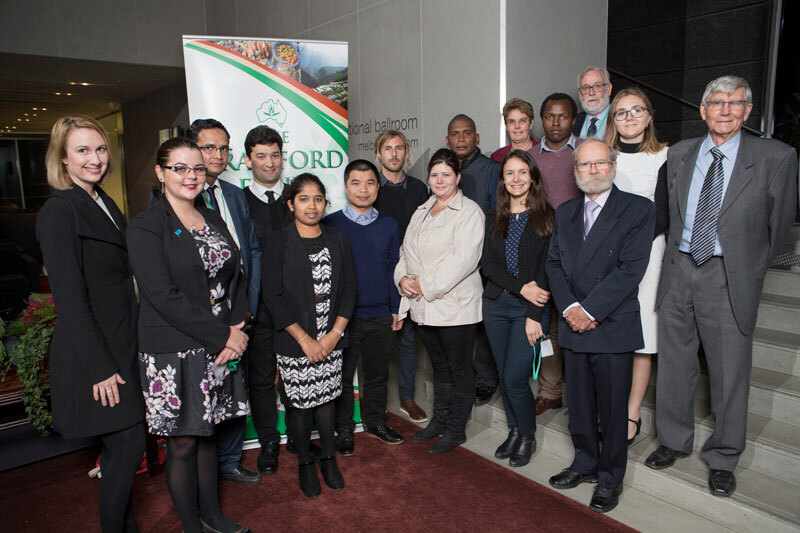 The 2017 Crawford Fund conference “Transforming lives and livelihoods: The Digital Revolution in Agriculture” was held in Canberra from the 7-9 August and focused on addressing global food security through the use of digital technology. What insights did I gain from this experience? A better insight into the complexity of the agricultural discipline, current issues facing global food security and the need for collaborative research and data sharing across disciplines. Global problems need global solutions. Networking with sponsors and scholars. I was able to talk directly with keynote speakers at the networking dinner. Realising that my current research project will have the ability to make a difference and that technology will play a key part in future research. Attending Parliament House and being able to see our Parliamentary Members in action. On day one we had the opportunity to introduce ourselves and meet our mentors and other scholars, followed by a networking dinner and a brilliant address by Dr Lindiwe Majele Sibanda. I was naturally drawn to Dr Sibanda not only for the inspirational way she told her story about growing up on her family farm in Zimbabwe, but because I too am originally from the southern region of Africa. I managed to talk with Dr Sibanda after her address – we talked about agriculture and nutrition, reducing consumer waste and the need to add sustainability to the agenda. I met a fellow scholar from Uganda who wants to follow my research on off-stream watering points for riparian protection as Ugandan farmers have installed watering points away from streams, but for unknown reasons the cattle aren’t using them. On day two we attended Parliament House to listen to a range of speakers. Initially the conference focused strongly on economics, marketing and how we can use data collection to increase yield production and profit, particularly in developing countries using digital technologies. The conversation turned when Dr Herrero, Chief Research Scientist from CSIRO, asked pertinent questions, including “Are we farming to meet our sustainable goals?” and “Is increasing our production sustainable for our planet?” These questions resonated strongly with me as an environmental scientist. We need to consider not only production and economics, but also social, cultural and environmental values if we are to move forward. I found this conference to be informative, exciting, intense, fun and an eye-opener about what is happening in the world. I would love to attend again in the future and I would definitely recommend that my peers attend this conference as well. I was refreshed and enthusiastic to be back on the research track after inspirational talks of eminent scientists in the field of agriculture. The conference was more organised towards the theme to cover digital revolution in agriculture. All the stories in conference really touched my mind and opened new thinking of research. As I am come from Sri Lanka, there was a lot to get from the conference to apply in future. Especially case studies in Vietnam and other developing countries awakened me to addressing issues of smaller scale farmers. I was extremely inspired by Dr. Lindiwe Sibanda’s John Crawford memorial speech. She nicely gathered the audience to a true life story about how African family based agriculture led to nutritious diets and she highlighted the importance of a diverse diet rather than focusing only on calories. The Crawford Scholar days and conference provided every one with a fantastic opportunity to learn about some current efforts by Australian scientists to merge digitalisation and agriculture. The case studies nicely explained how a little mobile phone could connect farmers with extension services, markets and peer groups. This is really applicable for my country where the digitalisation of agriculture for farmers remains at very poor levels. The other important information highlighted in the conference speeches were big data sharing. The research is taking place all around the world however only a small amount of important data is accessible for the farmers to use in the industry. This was highlighted by Dr André Laperrière. Furthermore, the RAID network event and scholar days provided awesome opportunities to meet people doing diverse research in the field of agriculture. This allowed us to mingle with people with similar research interests working in different countries and this created a cluster of people attached together on Twitter, Facebook for future data and knowledge sharing. The networking dinner was a remarkable night to meet delegates from different institutes and also from different countries. Both formal and relaxed talks made us more free and attentive. This was an opportunity to understand chances for volunteering and accessing funds from ACIAR. I appreciated seeing the previous works done by scholars and volunteers in the developing countries for global agricultural production. The arrangement of an individual mentor for each scholar was really useful. It was worthwhile not only for the Conference but for future network building in regards to common research interests. My mentor encouraged me for the future research and helped to mingle with the people in the same area of research. My sincere thanks goes to the Central Queensland University for funding support, and organisers and the members of the Crawford Fund for this incredible experience I gained during last few days. It was really amazing and very well organised. I will surely encourage my colleagues to attend the upcoming Conferences and I also wish to attend future conferences. Finally, I believe that the Crawford Fund conference has answered some burning questions for me. I would like to acknowledge and thank the Crawford Fund administration for facilitating my attendance at the conference in Canberra. It was eye-opening to see Australia’s role in agricultural research in developing countries. More importantly, the theme of this year’s event was relevant to my studies and my current work. By attending the conference I was able to network and engage with other students, researchers and professionals interested in agriculture in developing countries. Being a student from a developing country, who previously interacted with professionals who were implementing development projects from an NGO perspective, rarely did I have the opportunity to interact with scholars from other countries (such as Australia) who were researching agricultural issues for the benefit of developing countries. One outstanding observation was the atmosphere the mentors and senior researchers provided. They were approachable, keen to listen, supportive and very interested in feedback and follow-up. In particular, the ACIAR board members were very helpful. Given my research interest in the conference theme, I was keen on the discussions and presentations, especially how I would apply them in my studies and online for a small-scale digital farmer’s marketplace. Of interest, was the importance of data and whether data should be commercialised or be provided free. Although it is still debatable, access and relevancy of data in decision-making was highlighted and I concurred with the speaker who suggested that the agricultural data should be free. The second highlight was how technologies can be used to attract the youth and new generation of farmers. Considering that the young generation is adopting technology in other domains, for instance social media, in the same way technology such as drones can be used by the young generation of farmers in farm operations. The conference reinforced my view that engagement and interaction of various partners in agriculture through public private partnership is necessary if digital technologies are to transform the agriculture sector. Although my research is on digital technologies, it was of concern to note that agriculture is the least digitised industrial sector. This provides an opportunity to explore, meaning my area of expertise is relevant and important now and in the future. In conclusion, my attendance and participation in this year’s conference was of great value both to my studies and in realising the contribution I can make to rural development in Kenya. I would recommend the Crawford Fund Annual Conference to others since it’s a great opportunity for upcoming scholars in agriculture. Thanks to all those who were involved in enabling my stay and participation in the conference, much appreciated. Surviving a long PhD journey needs motivation, and listening to and interacting with gurus provides you much needed steroid dose against procrastination. I think it was timely for me to attend this year’s Crawford Fund conference, which was nicely sandwiched between the inspirational evening Sir John Crawford Memorial Address and the Mobile Acquired Data (MAD) Showcase. Dr Lindiwe Sibanda from Alliance for Green Revolution in Africa gave an inspirational Sir John Crawford Memorial address titled ’A New Narrative for Ending Hunger’. Lindiwe not only shared an African perspective to food security but also a very personal family experience, highlighting the importance of agriculture and agricultural development in the lives of real people. The main conference day started with an interesting introduction by the Former Deputy Prime Minister and Chair of The Crawford Fund, and a similar one about agricultural development by the Minister Joyce in his opening address. During the day I learnt about the practical application of different technologies that can bring digital revolution in agriculture, particularly with a focus on enhancing food security and transforming livelihoods. The common use of hand held devices coupled with easy access to internet has immense potential of bringing latest information and smart agricultural technologies to the smallholders. Research on use of on-farm digital technology in agriculture at University of Sydney seems to be promising for replicability in smallholder agriculture. Professor Salah Sukkarieh shared the advancements of low-cost and easy to use technologies for improved agricultural, which I think will also attract younger generation towards agricultural sector. Further, precise agriculture will contribute towards promoting climate smart agricultural practices. The day ended with very interesting presentation by Dr Andy Jarvis, who works for the International Centre for Tropical Agriculture (CIAT) and Research Program for Climate Change, Agriculture and Food Security of Consultative Group on International Agricultural Research (CGIAR). Although he was the last to present his interactive presentation brought in refreshing ideas regarding research and development on digitisation of agricultural systems with a focus on developing countries. I liked his very honest point of view about data collection in agriculture i.e. the trend of mining data from farmers without providing them any information in return, however there is a realisation among research community about better feedback practices. I really appreciate the approach being adopted by Global Open Data for Agriculture and Nutrition (GODAN) for open access of big data, which can contribute transform livelihoods of smallholder farmers. It was interesting to listen to the realisation among research community about importance and need of openly sharing the data about agriculture and nutrition with all stakeholders, making it available, accessible and usable. The best thing, and rather quite unique one, in this conference was the idea of mentorship. I was lucky to have Peter Horne as my mentor, who holds the portfolio of General Manager, Country Programs at the Australian Centre for International Agricultural Research (ACIAR). I liked this idea a lot, as this not only provided a focused and quick learning environment but also the opportunity of networking through your mentor. When the official conference came to a break, I took a selfie at the Theatrette and Mural Hall and posted to my Facebook page. This was the first of mine after more than ten years using social media. My country of origin was named by several speakers in their presentations. I am from a less privileged nation that, although plays an increasingly higher role in global community, constantly benefits from international collaboration. Either as a local in-country researcher or an international agricultural scientist, I am supposed to contribute to that transformative change. I have worked for more than 10 years in the agricultural sector and international cooperation has been an important part of my work. My current PhD in Australia is generously funded by DET’s Endeavour scholarship, and people believe that I can do well, yet I always struggle to self-assure of my capability, even after being nominated USC’s Crawford Fund Scholar for 2017. It was great that before the conference, a list of young scholars attending the conference was distributed. It made me comfortable to have someone, who is not at a too high level, to talk to at the convention of Australia’s eminent agricultural scientists. But what I appreciated much is the concept mentor-scholar pairing. Yes, there would be someone with a wealth of experience who promised to take care of me and assist me in communication. I started to overcome my diffidence at the first day when I felt the welcoming environment and went through the scholar program which was specifically designed for early career researchers. Dr Lindiwe has been greatly impacting the world but her story did not make me think of something too far away from my arm reach. People from RAID have done an excellent job in organising scholar days; they themselves excellently demonstrated how younger, energetic people can actively engage in research life in Australia. Professor Lester Burgess, who is probably one of the biggest names in contemporary agricultural research, went into detail about how a beginner scientist in my country has been learning, growing personally, and contributing to a more food secure world. I understood that to the CF2017 organisation board, motivating younger generation really matters. I was also impressed learning how the “established” scientists were keen on talking to young scholars during both scholar days and the official conference sessions. People I talked to were all willing to tell me about their work, to explain how the Aussie research system functions, and to hear about my study. This allowed me to gain more insights into the broader world surrounding my research focus, and more importantly this made me think I am part of the system. It does not sound too special for someone to take a selfie, particularly when you are proud of your presence. But for me, I know the days in Canberra excited another part of myself: I belong to a network, and there is place for me to make contribution. At least, networking did not seem too difficult even when you were a humble introvert researcher. Please send my thanks to Forest Industries Research Centre-USC for the scholarship; Dr Anthony Ringrose-Voase for his time as my mentor; and to CF2017 organisation people for the great opportunities. In August of 2017 I was one of the privileged students awarded with a scholarship to attend the Crawford Annual Conference in Canberra as a young scholar. This conference aims to address topics worthy of global and Australian attention and this year the focus was “Transforming Lives and Livelihoods: The Digital Revolution in Agriculture”. The conference was an enriching experience, allowing me to be involved with students and professionals working on different areas of agriculture and environment sharing their professional and personal experience. The key message of the conference was the use of technology in data collection by smallholder farmers. The speakers manage to bring case of study from many parts of the world about the advantages of using technology to access and collect quantitative and qualitative data, which can help farmers to save time and easily access valuable information about crops, pests and pathogens control, trade and market of their productions, improving their knowledge and experience to make better decisions about their farms. Moreover, innovative technologies were exposed such as multifunctional digital farmhand developed for small scale farm, capable of sample, evaluate, treat the crops, and Mobile Acquire Data (MAD) the using platforms for tablet devices and smartphones to help farmers to identify problems quickly with enough information to give them authority to make better decisions about their farms. The constraints and challenges related to the use of technology for acquire data were also covered during the presentations, including data ownership, time requested for training, initial investment and problems with inadequate platform design. I was personally interested by the study of case about “Big Data for Genebank Mining” ministered by Dr Ken Street related to a new tool for rapid mining of agricultural genebanks called Focused Identification of Germplasm Strategy (FIGS). This topic can be related with my research and I will certainly search for the references of his presentation to improve my research. Furthermore, the talks ministered by Pham Thi Sen and Lindiwe Majele Sibanda were memorable, not only by the importance of their research for agriculture and sustainability, but also for their history and journey through their careers. It was very inspiring to listen to these empowered women sharing their experiences and showing the role of woman in agriculture, which means we are, perhaps, one step closer to gender equality. During the Crawford Conference it was also possible to learn more about Researchers in Agriculture for International Development (RAID) which is a platform promoting network for early to mid-career researchers with an interest in agriculture and international development. I appreciate the student’s presentations about their experiences working in development countries, especially considering their capacity to overcome difficulties, maintain the research and give their contribution to the society. To conclude I would like to thank Forest Industries Research Centre (FIRC) and University of the Sunshine Coast (USC) for the opportunity to attend Crawford 2017 Conference. It is important to keep updated about the main agricultural topics and this experience was extremely informative. I will strongly recommend other students to attend future conferences as it is a good chance to develop networks, improve as a researcher and learn more about agriculture and sustainability. It has been a pleasure to be awarded a scholarship to attend The Crawford Fund conference in Canberra. I therefore would like to thank the Queensland branch of Australasian Agricultural and Resource Economics Society for giving me that opportunity. In particular, many thanks go to Professor John Rolfe, Dr Andrew Zull and Dr Peggy Schrobback for their generous contribution. Being an early-career researcher with a lack of working experience in Australian context, I was able to build up my professional network through the conference participation. In particular, I enjoyed fruitful discussions with my mentor – Honorary Professor Malcolm Wegener, who was very supportive in connecting me with his colleagues as well as passionate about the contemporary issues in agriculture and food industry. We are both keen to catch up over coffee from time to time, since we are both based in Brisbane. From interesting presentations by high-calibre researchers and experts, we have learned a lot about uses and challenges of modern technologies for agricultural development and food security. The audience was very pleased to listen to the informative and interesting presentations. In particular, in her Sir John Crawford Memorial Address, Dr Lindiwe Majele Sibanda shared a story of her life, full of emotions and empathy. With big challenges throughout her career, she could become a great mind-setter not only for her Zimbabwean compatriots, but also for many young people worldwide. Thanks a lot to the conference organisers for having Lindiwe with us. I was also introduced to the network of Researchers in Agriculture for International Development (RAID), whose young and motivated members shared their experience of working in developing settings. Now, I am very excited to be part of RAID, and for that I started collaborating with the Queensland representative of RAID, Bianca Das, who has shown her passion in building a platform for young researchers. Certainly, I am very grateful to The Hon John Anderson AO, Professor Andrew Campbell, Dr Colin Chartres, Professor Shaun Coffey and all other people who have been working hard to maintain high standards and the great reputation of The Crawford Fund in Australia and worldwide. I am especially happy to meet Cathy Reade, whose enthusiasm and brilliant organisational skills made the conference run smooth and exciting. Thanks Cathy for your warm smiles in cold Canberra. Last but not least, the honour to become a member of The Crawford Fund is hard to overestimate. Being passionate about making a better change for the sake of global food security, I am now happy to share this drive with my senior colleagues. Thank you very much.